Origin and Habitat: Cerro Parfido, Route 8 Km 153, Lavalleja, Uruguay. Habitat and ecology: This specie grows in a small rocky area about 500 m long and 200 m wide. The plants are very small and difficult to find among the rock. Accompanying cactus species are Notocactus obscurus nn (PR 81a) and almost a meter high form of Notocactus scopa. The population is probably affect by goats and fires, even though this poses a minor threat. After fire the plants look like small burned cucumbers while deprived of their spines, those burned plants later start growing again and readily produce their beautiful spines. 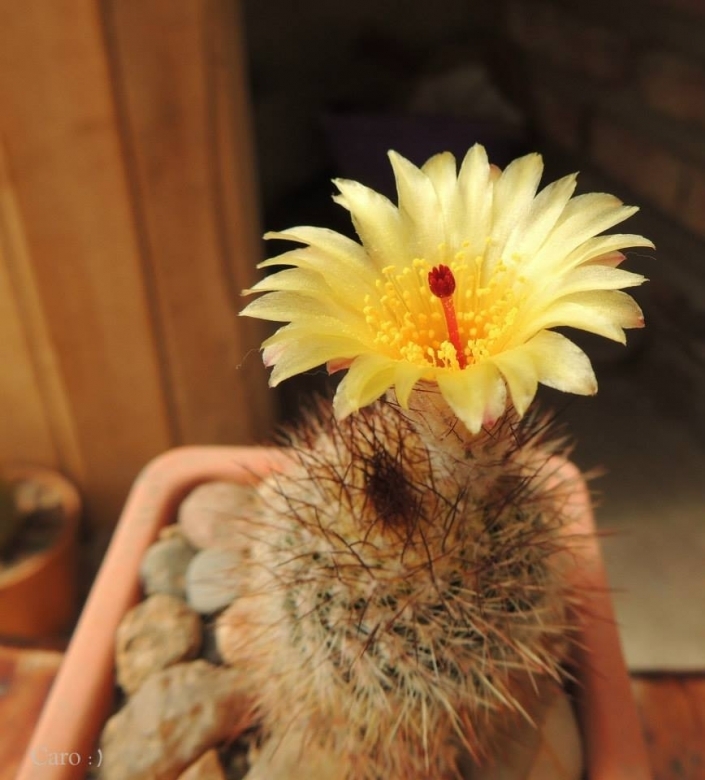 Description: Notocactus brederooianus is a small globular cactus, with white or yellowish-white radial spines, and red centrals. It represent a link between Notocactus tabularis (Parodia tabularis) to which it is synonymized and Notocactus scopa (Parodia scopa). Derivation of specific name: It has been named after the Dutchman A. J. Brederoo author of numerous articles in cactus and succulents journals. Stem: Solitary, globose to pyriform, green, 7-10 cm long and 6-8 cm wide. Crown flattened, concave in the centre, about 5 mm deep, concealed by spines. Ribs: 20-22, 9-10 mm hight, 2-3 mm wide, slightly twisted. Areoles: Brown, circular, approximately 1.5 mm wide in the upper part of the stem with white wool, about 3 mm apart. Spines: Soft. radial spines glassy white, very numerous (35-40), spreading, 5-10 mm long; central 6, dark reddish brown, flexible, upright, three of which stronger up to13-18 mm long, the shorter 10 to 12 mm long. Flowers: Buds about 15 mm long and 10 mm wide, with grey-brown wool and long brown hair. Flowers funnel-shaped, 6-7 cm long, as well as broad; flower tube green, with grey wool and long brown hair. Tepals broadly lanceolate, 45 mm long and 7 mm wide, shiny yellow with a special metallic shine; outer tepals smaller with a greenish stripe in the outside. Filaments 12 mm long, yellow, the lowermost slightly reddish at the base. Anthers ochre, very rich in pollen. Pistil c. 25 mm long, 1 mm wide, red. Stigma magenta, with 10 lobes, 5 mm long. Ovary 12 mm long and 5 mm wide. Fruits: Ovate, yellowish green, 12 mm long and 7 mm wide. Seeds: About 1 mm long and 0.8 mm wide. 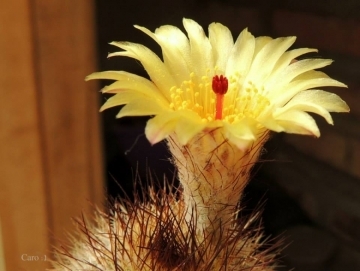 Notocactus brederooianus Prestlé: has white or yellowish-white radial spines, and red centrals. It is intermediate between Parodia tabularis and Parodia scopa. Distribution: Cerro Parfido, Lavalleja, Uruguay. 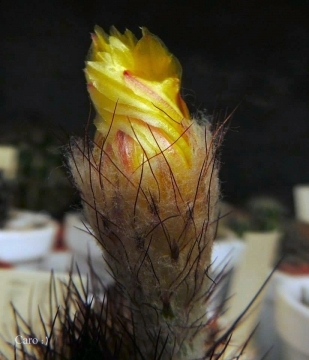 Parodia tabularis (Cels ex Rümpler) D.R.Hunt: (subsp. tabularis) has 16-18 radial spines and 4 central spines, flowers up to 7 cm long. Origin: Brazil and Uruguay. Parodia tabularis subs. bommeljei (Vliet) Hofacker: has about 12 radial spines and 3-4 centrals, flowers smaller (less than 6 cm long). Distribution: Rio Grande do Sul, Brazil. Cultivation and Propagation: This is an easy plant to cultivate. It require a mineral-based potting mix with a good drainage. Can support quite some water during the growing season but pot plants in winter are wet-sensitive and needs to be kept dry (rots easily if soil is wet and cold). Usually it is recommended to over-winter this plant in a bright and warm greenhouse with at least 8-10° C, but it has proved to tolerate temperatures as low as -5° C for short periods. Sun Exposure: Light shade to full sun but doesn't like full, hot blazing sun in the central summer month. Propagation: Seeds, cuttings. Not too difficult to raise from seed. Sow be in a sterile environment. It is recommended to graft seedlings to speed growth. Plants on their own roots grow very slowly but live longer than the grafted ones.